This Sunday, The Toff in Town will host a tremendous 12hr marathon of music, featuring 17 bands and artists playing everything from rock, blues, indie-pop, soul, and even some Beethoven! 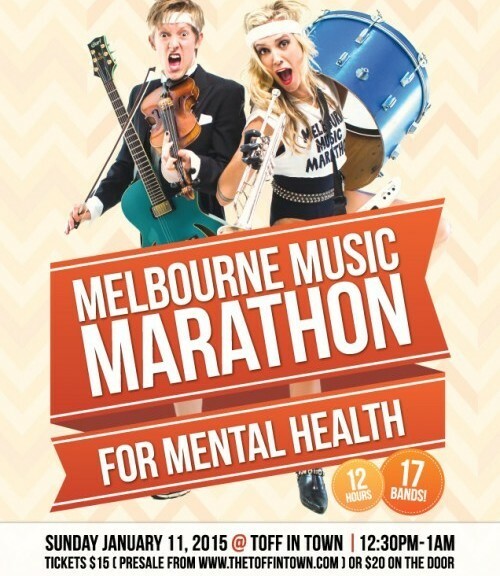 In an extraordinary show of solidarity, the musicians (and venue) are donating their time to this fundraiser so ALL proceeds can go to beyondblue. Event organisers Callum Moncrieff and Brihony Dawson, themselves musicians whose lives have been affected by mental health, aim to raise awareness of depression and anxiety. They’ve created an Everyday Hero page in support of Sunday’s event for those who can’t make it there but wish to give a donation. On the night, event host Kara Bertoncini, entertainment journalist, performer, and model, will be introducing the impressive musical lineup that includes: rock-soul diva Stella Angelico, soul band Mayfield, indie-pop singer Chris Watts, the Leah Zweck String Ensemble, soul/r’n’b performer Thando Sikwila, The Tarantinos (who play the tunes from Tarantino films), Brazilian Choro and Samba band Trio Agogo, blues artist Sweet Felicia, and more! For a full line up and performance times, see the mmm4mh Facebook page. Tickets are $15 online or $20 at the door. Doors open at 12:30pm, with Seb Mont kicking off at 1pm. See you there!